Typically April is the start of swarm season for honey bees; however, our warm winter may result in an early start to the swarm season. 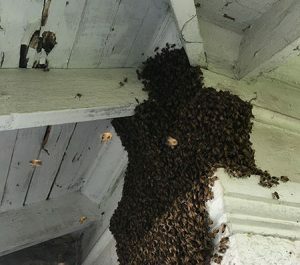 Swarm season can be a dangerous time for honey bees because some people may become frightened by the swarm and try to destroy it. Honey bees in a swarm are not aggressive and local beekeepers will remove swarms, often for free. “When a swarm arrives people will see a cloud of bees. The bees will circle and collect into a cluster that looks like a beard,” said John Benham, former president of the Kentucky State Beekeepers Association. Contact information for your local Extension Office can be found at http://extension.ca.uky.edu/county. If the Extension Office is closed, then you can find a list of local beekeeping organizations on the Kentucky State Beekeepers Association’s website at http://www.ksbabeekeeping.org/table-of-local-beekeeping-organizations/. The contacts listed for the local organizations can put you in contact with a local beekeeper who will collect and remove the swarm for you. Local beekeeping organizations offer opportunities for anyone interested to learn about honey bees and beekeeping. Media wishing to do a story about swarms and local beekeepers can contact Tammy Horn Potter, Kentucky State Apiarist (502-573-0282), John Benham, former president of the Kentucky State Beekeepers Association (270-678-7924), or the contact for any of the local beekeeping organizations listed at http://www.ksbabeekeeping.org/table-of-local-beekeeping-organizations/. 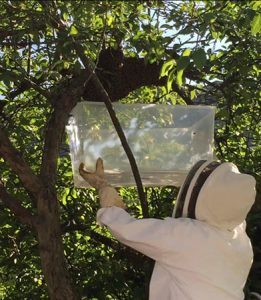 Watch beekeepers capture a swarm that landed in a tree in a residential neighborhood. Video courtesy of Michele Boling.